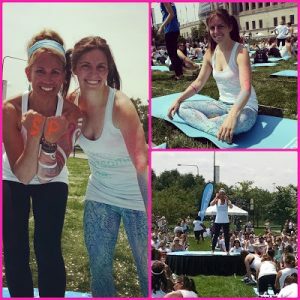 Soul Pose is the newest event from The Color Run company: a fusion of the premise behind color runs and the growing trend of large scale yoga festivals. The end result may be the pinnacle of fitness-related events! Soul Pose incorporates the throwing-things-around elements of color runs, but without the intimidation of having to travel a 5k distance to participate, making the festival far more accessible to a wider range of people. Even those hesitant about their yoga level will find joy in this event – it’s incredibly newbie-friendly, and delivers the same experience regardless of your previous yoga practice (or lack thereof). I’m not sure what I did to get the two most beautiful days of the year, back to back, on this particular weekend, but we had perfect weather for yet another outdoor event! In fact, it might even have been a little on the hot side, since there was no cloud cover to protect from the sun, but I’d rather have steaming sun than pouring rain. Driving into the city had me a little misty-eyed, knowing it would be my last trip downtown for who knows how long, but arriving at Soldier Field (and parking conveniently, if expensively, right on site) only brought smiles in eager anticipation. I’d bummed out of Wanderlust last year for a mix of reasons, and had regretted it, so I was determined to make Soul Pose as wonderful as possible. Bubbles and smiles, ready for whatever wisdom Soul Pose was preparing for me. Upon arrival at the festival, one of the first draws was to the body paint tent, where they had markers in many BRIGHT colors! Most people attended the event with friends who could help them draw, but I managed to get some decorations going on myself. 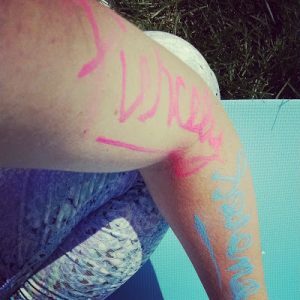 On the walk from my car to the tents, I had settled on a mantra for the day’s practice, and chose to write that on my arm where I could see it all day: Fiercely Serene. I have been realizing in the past few months, maybe even over the past year very slowly, that I have always been fierce, but usually I’m fiercely frantic or fiercely obstinate, and these are not ideal combinations! Little by little, I have been finding ways to work serenity into my life as a balance for my fierceness, but there is still much room for improvement. By adopting this mantra for Soul Pose, I set my intentions for my own future, and I think having that sense of purpose and awareness greatly enhanced the spiritualism I felt while participating. After donning my paint, I browsed the other tents briefly. The Soul Pose store had some really cool items, and they were actually reasonably priced, so I picked myself up an official event tank top before moving on to the sponsor tents. Most of the vendors were local yoga places, and their giveaways were all Chicago-based, so I shied away from the area pretty quickly since I have no use for a Chicago studio membership at this time. Instead, I headed over to the check in line that looked intimidatingly long. Fortunately, they were moving very quickly. Before long, I had my yoga towel in hand (we received our Soul Pose bracelets as we exited), and was searching for a mat. My mantra, in the flesh, as it were. Somehow I managed to land a great spot right next to the instructor’s entry lane, starting the one-hour yoga session off on an exciting foot. It only got better from there. 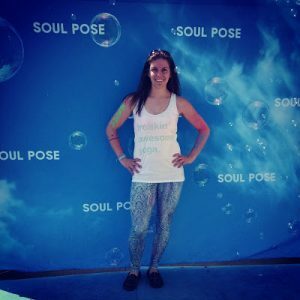 The one thing that can break an otherwise fantastic event, or make a horrible event fabulous, is the instructor, and while Soul Pose definitely hit the mark in a lot of ways, here is where they really knocked it out of the park. Elise Jones was the perfect voice for this event. Calm, comforting, humerous, understanding, wise, and the list goes on for days. 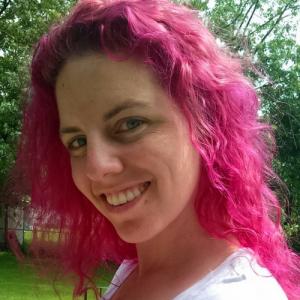 She offered clear instruction, plenty of encouragement for beginners but not so much that a seasoned practitioner would feel babied, and always suggested modifications and challenges. What really impressed me were some of her anecdotes. Her words spoke to my heart and soul, and I found myself identifying my Fiercely Serene mantra within each of her pearls of wisdom. After the event, she hung around for photos with anyone who approached, and offered hugs and Truly the highlight of the experience, and a treasure Soul Pose should hold on to tightly! Just a couple highlights, including the most insightful yoga instructor I’ve ever had. Eventually, the scorching heat started to wear on me. Unfortunately it was right about savasana time that the sun decided to become unbearable! For those who have not practiced much yoga, savasana or “corpse pose” is commonly used at the very end of a yoga session, and involves lying still on your back with your eyes closed. 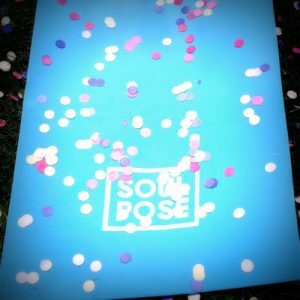 It is a resting and reflective position, but when you sign up for an 11:30am outdoor yoga event at the end of June, it shouldn’t be much of a surprise when the noon hour heat makes savasana a sweaty mess! I draped my towel over most of my face, which definitely helped, but by the end of the session I just knew my arms were toast. Better yet, I’d have some killer tan lines around my body paint! But as the session drew to a close and I rolled up my mat, I could only think one thing: WORTH IT.